This is a combination of qualitative and quantitative methodologies used to enquire individuals. For example a combination of online (customers lists or online panels) and CATI approaches to target different groups. The precise mix is tailor-made to each project. You can get all the information you need from each interview and you’ll know for sure that you’ve got it. Data collection is typically cost effective and quick, allowing you to get the report that much faster! The most beneficial approach to market research is one that considers both qualitative and quantitative research as complements to business outcomes. This methodology is particularly useful when a combination of quantitative and qualitative data is needed and visual stimuli or products are to be tested or used as prompts. Respondents are recruited to a central location where visual materials and prompts, such as products, creative concepts or visual representations of services (story boards, videos etc) are set up in a specific manner. Upon arrival and prior to viewing concepts, respondents usually complete a questionnaire about themselves to establish demographic and psychographic profiles, buying behaviour and lifestyle issues. They then view the new products or concepts, either as a group or with the assistance of an individual interviewer. At this stage, each respondent completes another questionnaire to ensure that individual views and perceptions can be collated. This data is subsequently analysed and is able to show results prior to the respondents’ interaction with other people. Once the one-on-one or viewing sessions are finished, a selection of respondents are often invited into a focus group discussion. This is run by a trained market researcher to obtain more depth about key issues, motivators and inhibitors. Respondents by this stage are very focused and these groups tend to be more effective than normal. 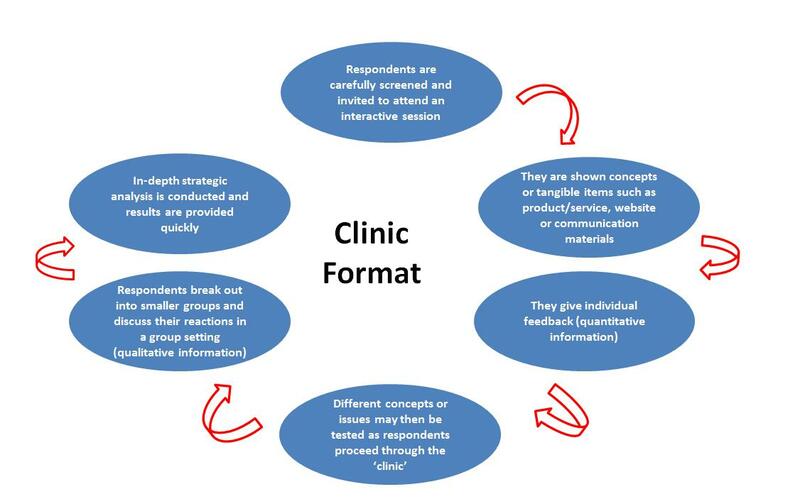 The format of clinics is very flexible and can be customised based on the target market and objectives of the research.